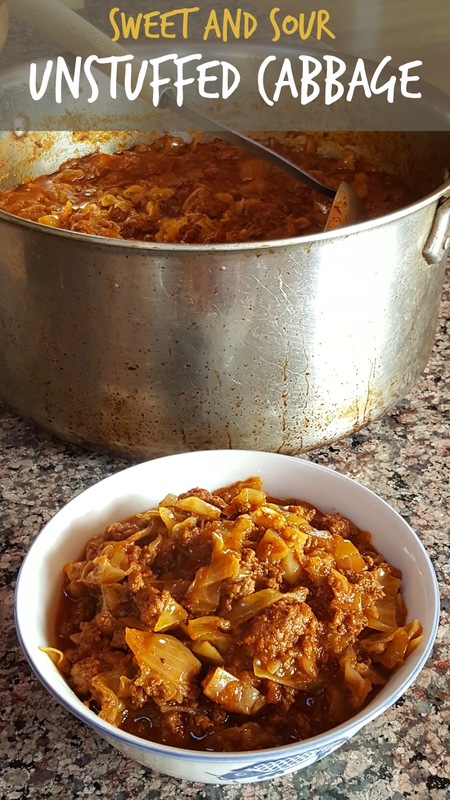 My Grandma Rose made the best stuffed cabbage, sweet-and-sour style with raisins and lemon slices. But she didn't make it often because it was a *bleeping* pain in the *bleep* to blanch the cabbage, separate the leaves, and roll up all those little suckers. Right after I launched my new Fruitchup Paleo ketchup, which is sweetened with raisins and dates instead of added sugar or artificial sweeteners, I realized that it was the perfect ingredient for Sweet and Sour "Unstuffed" Cabbage, because it actually contains everything Grandma Rose would have put into her stuffed cabbage, except for the meat and the cabbage. 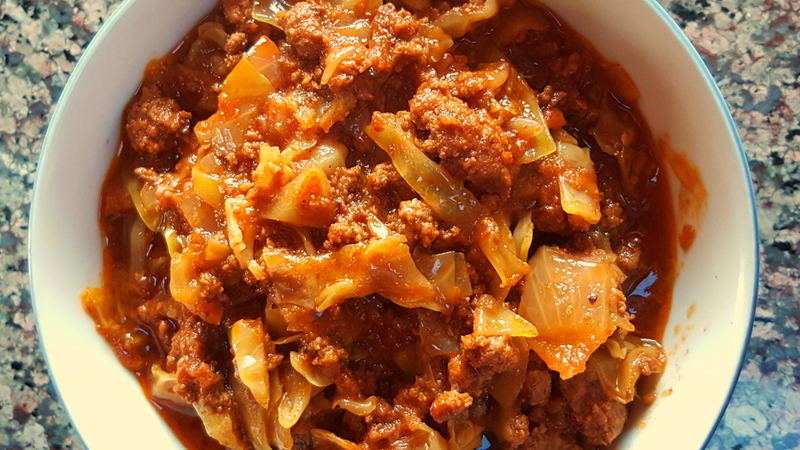 This Sweet and Sour Unstuffed Cabbage recipe is Paleo and Whole30 compliant, requires only four ingredients, takes only 10 minutes of actual work (plus a few hours to simmer on the stove), and will bring my Grandma Rose right into your kitchen. I gave some of my last batch to a friend and her whole family loved it, including a preschooler and a baby. 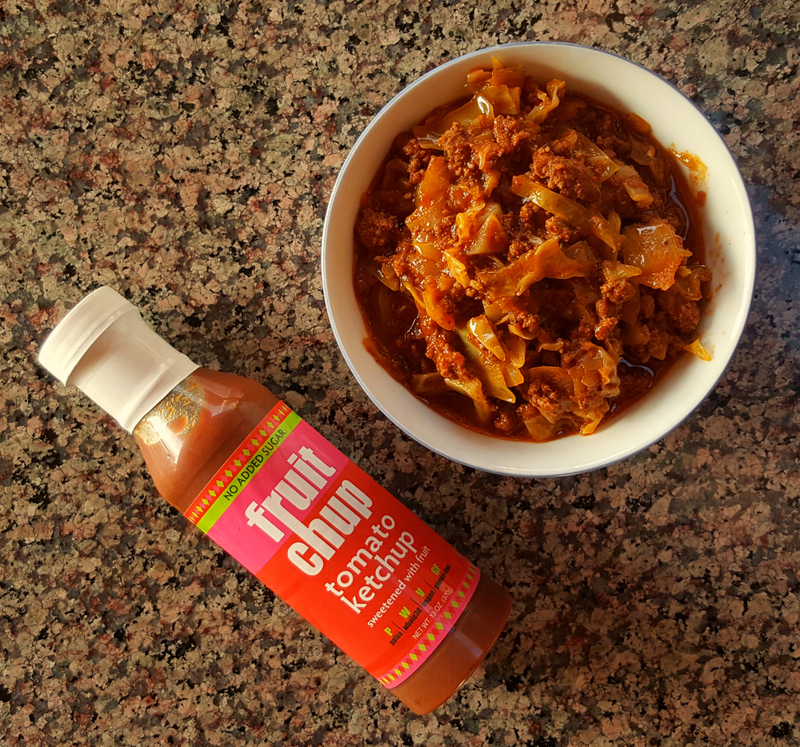 This delicious, hearty stew comes together in just a few minutes and uses only four ingredients, including Fruitchup Paleo ketchup. A variation on my Grandma Rose's classic stuffed cabbage recipe. In a large pot over medium-high heat, brown the ground beef, breaking it up with a spoon as it cooks.Add the onion, cabbage, and Fruitchup Paleo ketchup. Stir to combine and bring to a boil.Turn down the heat, cover the pot, and simmer 1.5 to 2 hours, until the cabbage is wilted and the flavors are well combined.Season to taste with salt and pepper. Serve hot. For those not following a Paleo or Whole30 way of eating, the Unstuffed Cabbage can be served over rice.